The front of your home is the first thing that people see. Like your outfit, how you dress your home can tell people a little bit about your personality. We live in an old, but charming 1930s Cape Cod in the suburbs of Philadelphia. Precious little has been re-done since the 1970s, but we love our home, and work to make it a reflection of our family. Neither my husband nor I are true DIYers - you won't find us refurbishing the bathroom. Nor is that where we want to spend our disposable income. I recently removed the filmy white sheers that had been hanging in all of our downstairs windows and replaced them with wood-like blinds. It was a simple and inexpensive switch, but made a big impact on the feel of the rooms. That's much more our speed of home improvements. Take our lovely front porch. Our house is stone, and the front porch has a 2 foot stone wall that surround it, with a break where the front walk is. It's very charming, gets nice shade and is rather secluded from the street. In an ideal world, the front porch could use some new concrete on the base, and a new front door. But those aren't in the time or money budget, so instead, we're going to give it a makeover. The first step in making over a space, is to remove everything from the space and leave it bare. Next, you should thoroughly clean the space. In this case, that means a good sweeping and a wipe down of the front door. I decided to save some money and use much what I already had. The only new purchases were an outdoor rug, some new pillows and plants. I found this outdoor rug on sale at Target. You can get a similar indoor/outdoor rug here. Consider making it colorful - they didn't have a color I wanted, so I settled for a neutral and brightened it up with accents. I've never had a rug on the front porch, and I was skeptical about it, but I really enjoy the cozy touch it lends. I also like going out there in the mornings, with bare feet and enjoying my coffee. Two surprising finds about the rug: it dries quickly and stays pretty clean. I also have a cordless vacuum that I can bring out there for a quick touch up. Once the rug was in place, I put our chairs back. 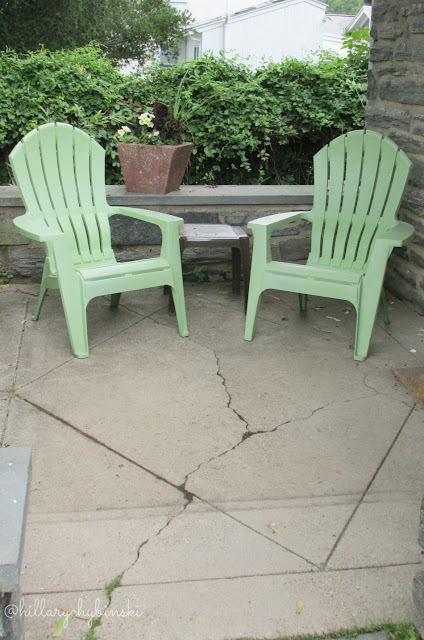 We have had these green Adirondack chairs for a few years (Lowes still carries them). I'm not wild about the brown table, and would like to get a ceramic garden stool in an aqua or coral color. I didn't want to put glass out there, but now with the rug, I think it will be okay. Now the "bones" of your porch makeover are done. It's time to dress it up. The easiest and most inexpensive way is with plants. Ikea has some wonderful large potted plants that I am considering for the back, behind the chairs. For now, I bought some inexpensive plants from Lowes and put them in various pots I had in the garage. 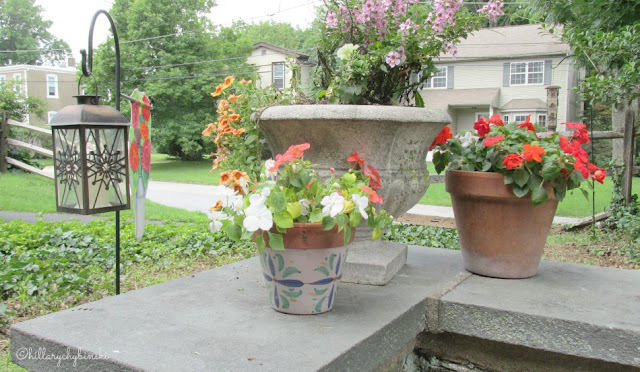 I prefer terra cotta pots, but you can use anything you like and the Dollar Store and other inexpensive places can be a great place to find flower pots. If you have a bunch, but they aren't quite to your liking anymore, consider painting them! I loved over this little flag stand, and we added an LED lantern for some interest and light. 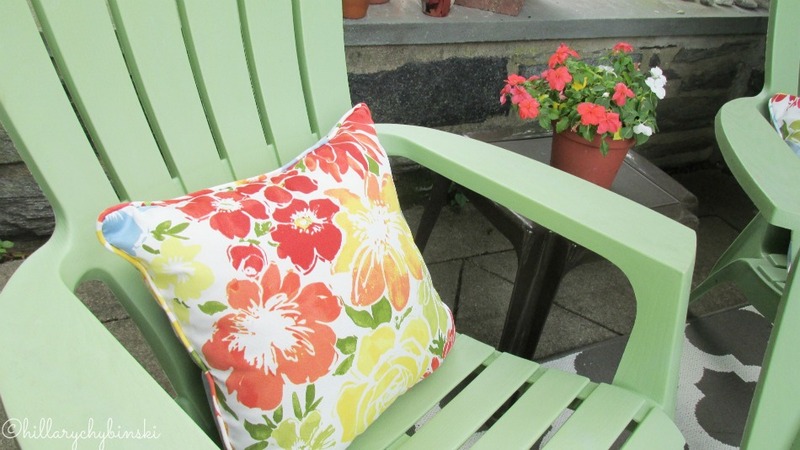 A few outdoor pillows finish off our makeover. Lighting is a challenge, since we don't have outdoor electricity on this end of the house. If you do, consider a string of fairly lights or retro bulbs on your porch. I'm also contemplating some big palm-like potted plants from Ikea to put in the corners behind the chairs. And there you have it. 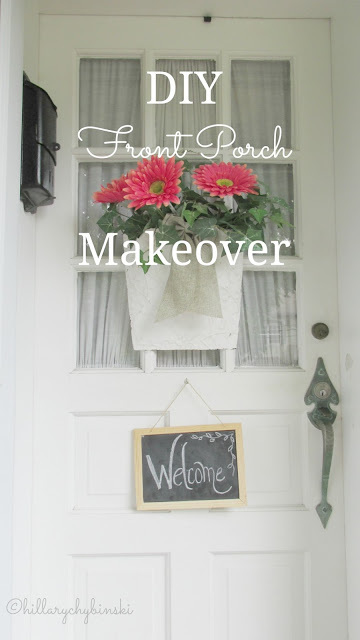 An easy, affordable DIY front porch makeover. Every space in your home should be liveable space that you enjoy. With some creativity, you can spruce up your own tired spaces and turn them into a new favorite spot! Come on over and we'll have some sips out there and catch up! 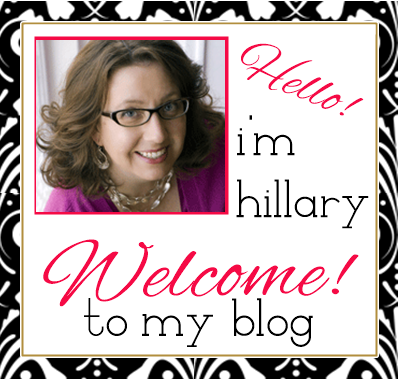 This post is linked up at Rustic and Refined. 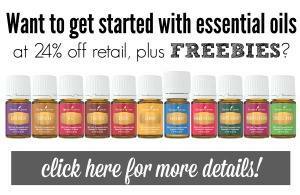 Check it out for inspiring ideas for your own home. 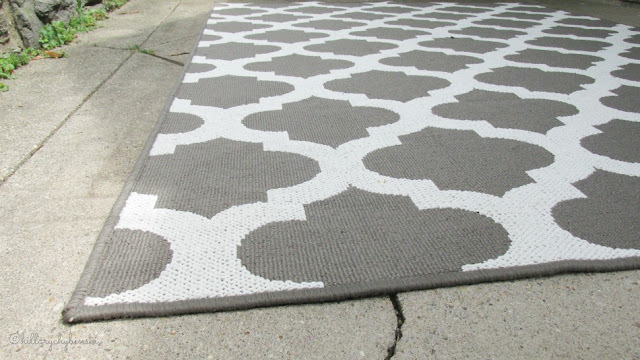 I'm digging the rug idea, I need to try that myself. I didn't think I would like the rug - but I really do - great investment, and many of them are on sale right now! Very pretty! I don't have a front porch ~ boo! Back porch? Deck? Any space really! 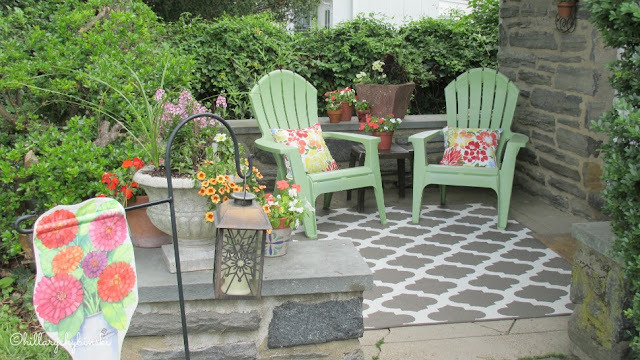 These days, places like Ikea sell inexpensive pavers and deck squares so you could totally invent a space for yourself! Thanks Jeannie - I was really surprised by how much I like it. Great details! I just shared my front porch too! Gotta go check it out Ann - thanks for sharing!! I love the rug and the pretty pop of pink. Its just right for a nice cup of coffee in the morning or tea in the afternoon. You did a great job! SO beautiful! I love fretwork and have a similar rug in my daughter's room. The pop of green is so happy too!